The following is an essay adapted from my TED Talk at TEDxMidAtlantic 2017, held at Sidney Harman Hall in Washington, DC on October 20, 2017. To watch the talk, scroll to the video at the bottom. For more photos of the event and the complete presentation deck, click here. 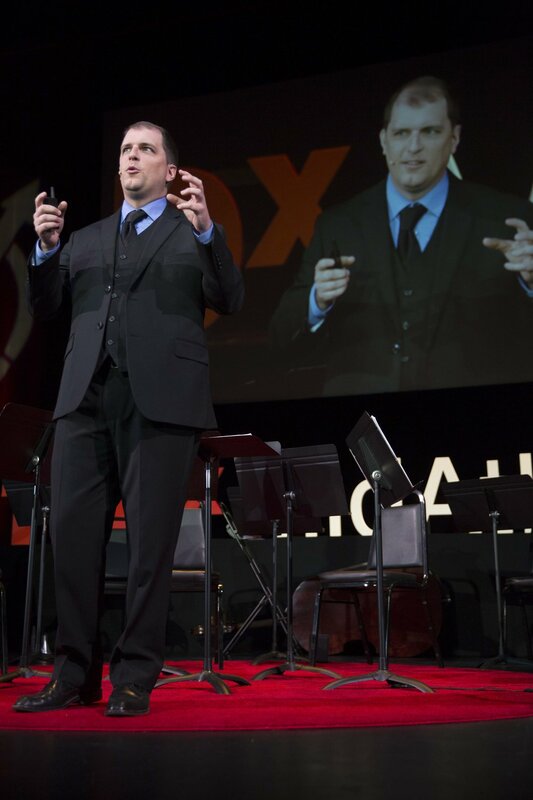 Jordan Randall Smith speaks at TEDxMidAtlantic 2017 in Washington, D.C. This is kind of like telling a small child that there's no such thing as Santa Claus: it's ok to think, it's just not ok to say out loud! In all seriousness, to the uninitiated, it is sometimes tricky to know quite what to think, what to feel, what to experience, to know what the experience is supposed to be. And it is worth discussing what the experience is supposed to be (spoiler alert: it's supposed to be whatever you feel like it should be!). But first, let's talk about this word, boring. When we think of boring, we think of carpentry. We think of metalwork, where the bore of a firearm or the bore of brass instruments comes to mind. It shows up in lots of other places too when we think about scale, and in particular, when we think about timescales. Love him or hate him, Elon Musk is no stranger to "boring timescales." The founder of Tesla, SpaceX, PayPal, he now has a new company. This new project is developing an underground vacuum tunnel that would span New York to Washington, DC and make it possible to commute between them in less than 30 minutes. If completed, this would revolutionize the I-95 corridor and it would transform the East Coast economy. And the name of the company is The Boring Company. This concept doesn't have to rely on such an on-the-nose example. This year is the 10th anniversary of the first iPhone. With new phones coming out every year, it's easy to lose sight of the fact that the first iPhone was secretly under development for four years, while some of the innovative technologies like the capacitive touch screen had been in progress for ten years. And that rests on another 60 years of high-tech innovation that gave rise to the core technologies that make up the modern phone, including Wifi, Bluetooth, Cellular, AI, and the list goes on. The best, big ideas end up taking big, boring timescales to achieve lift-off. And, it turns out that classical music is a perfect vehicle for the best ideas. This plays out across three phases and three corresponding groups. Ben Goldberg, composer. Ben's piece, Catalyst, received its world premiere at TEDxMidAtlantic 2017. The first phase is the composition process. To begin with, let's discuss composers. We tend to think of composers in popular imagination as free spirits, artists, libertines, and even demigods. It is an image of a special class of person who has tapped into something special that the average person cannot access. This is only half true: composers do tap into something special, but it's something special that we all have. Composers have merely turned their craftsmanship into a skill that which they have harassed their creativity to create the durable works of art we all appreciate. This process happens at exponential timescale, where a one-minute piece might be something a composer could dash off overnight, but a four or five minute work could take several months, and a 20-minute work might require a period of a year or longer to prepare. This is not unlike the challenges faced by engineers in designing a one-story house versus designing a 120-story tower. The tower is not merely 120 times more complex, but instead many 1,000's of times more sophisticated. The second phase is the purview of the performers as they go into rehearsal to prepare to realize the composer's vision. Here, every minute of music could take anywhere from four to twenty minutes of preparation, and that doesn't count the individual preparation required prior to rehearsal, especially on new works. Even a short work filling a small portion of one half of a concert could end up taking hours to prepare. The third phase is where the listener comes in. In the age of tweets, sound bites, and 2-minute pop songs, one would be forgiven for believing that ideas can uniformly be distilled into tiny, shot glass-sized containers. This is not so. Some things take longer, both to create and to consume. Let's look at consumption: Take candy. Sometimes you'd like the instant gratification that only sweet candy can provide. But, sometimes, what you want is a rich, delicious piece of gourmet chocolate cake. Sometimes you're looking for the carbonated effervescence and instant sugar rush of a can of soda, but sometimes what you really want is a robust, full-bodied glass of red wine. Thanks to The Mozart Effect, we have this idea that classical music is something like audio broccoli: something you do because it's good for you, rather than because you like it. Perhaps it is closer to something like musical vitamins: "Take two Mozarts, and in the morning you'll invent the next Facebook." This is of course false. But, it's false because it commits a category error when assessing music's value. Instead of valuing music in terms of its instrumental value, we need to understand its intrinsic value. Classical music does not provide its listeners with a means to access special knowledge in some other discrete domain. Rather, the "big ideas" are right there in the music. In the end, ideas that require patience and focus to understand are the ones worth pursuing, and classical music is a perfect vehicle for the best ideas. Symphony Number One performs the world premiere of Catalyst by Ben Goldberg. Jenkins, J S. “The Mozart Effect.” Journal of the Royal Society of Medicine 94.4 (2001): 170–172. Reuell, Peter. "Muting The Mozart Effect". Harvard Gazette, 2018. Accessed 25 July 2018. Spiegel, Alix. "'Mozart Effect' Was Just What We Wanted To Hear". NPR, 2010.